Got a problem with your boiler and can’t wait? There are various Gas Safe registered companies throughout the UK that offer emergency boiler installation and repair. Don’t want to wait for multiple installers to give you on-site quotes? But, what is an emergency, how much is an emergency replacement going to cost, and how quickly will the job get done? First up, let’s talk about safety concerns. If you smell gas, this is an immediate safety concern. 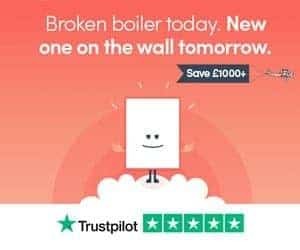 Is Your Boiler Installation An Emergency? An emergency boiler replacement is going to cost more than a typical installation. There are various engineers that work on 24-48 hour timelines for repairs & installs. To be able to service jobs this quickly, they have to charge more than a typical installation. We’d expect an emergency installation to cost 20-30% more than a standard installation. That said, an average installer will be able to complete a site visit and give a detailed quotation within 24 working hours. Typically, you’d not expect them to start the installation within the same working week, but within 7-10 days of initial enquiry is a reasonable guestimate. Whether you need an emergency installation, or have a looser timeline, you can get the ball rolling right now by getting your fixed price online using BOXT. The next question; if your boiler replacement is an emergency, how much is it likely to cost? Combi, system, regular, oil, or LPG? So, even from a “typical” perspective, an installation could be anywhere from £2,000-8,000. A standard installation might consist of a 30kw Ideal boiler. This is powerful enough to a supply a 3-bed semi that has reasonable hot water demand, and just one shower. You should expect quotes in the £1,900-2,350 range. Again, this depends on many of the variables mentioned above. Alongside this, remember that labour rates will vary throughout the country. For example, in London, an emergency boiler fitter might charge £100 per hour, with someone in Birmingham charging around £75 per hour and up North, sometimes as low as £50 per hour. In the example above (30kw boiler for a 3-bed semi), assuming there is no complications, the boiler should be replaced within 1 working day. For installations that have additional complications (for instance, additional pipework, or upgrading a regular boiler to a combi), you should plan to have your heating and hot water off for 1.5-2 working days. So, with an emergency boiler fitter, you’d expect the job to be completed within 2-3 days from initial inquiry date/time. That said, BOXT can get your new Worcester Bosch fitted by as soon as next day. You can use their online quote form to get the ball rolling right now. Thanks for reading our 3-minute guide to emergency boiler installation costs and timelines. Got a question? Leave a comment below and we’ll get back to you as soon as possible.